Saturday, May 24, 2014 saw the addition of a new priest to the Paulist ranks. 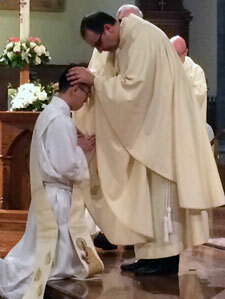 “Jimmy” Hsu, having completed his formation period was ordained by Bishop Joe Vasquez of Austin, Texas. If you dig into the archives of the Paulist Fathers’ website, you can trace Jimmy’s formation. For Yao “Jimmy” Hsu, the novitiate year was a chance to experience St. Paul, the legacy of faith left by Paulist founder Servant of God Father Isaac T. Hecker and being part of a community. “[Making first promises] is the first formal step to being part of the Paulist community, but is another small step in the road ahead,” he said. Fast-forwarding to September of 2013 brings us to Jimmy’s final promises, payment for service (one penny) and ordination as a transitional deacon. Jimmy Hsu, CSP, took his final steps toward the priesthood by pledging a lifetime of service with the Paulist Fathers before his Paulist brothers, family and friends Sept. 6 in the chapel of St. Paul’s College in Washington, D.C. The next morning, Mr. Hsu was ordained to the diaconate in the Crypt Church of the Basilica of the National Shrine of the Immaculate Conception by Most Rev. Barry C. Knestout, auxiliary bishop of Washington, D.C.
After one year of ordained service as a deacon, and update on the Paulist Fathers’ website reflects on Jimmy’s journey and his impending ordination. Encouraged by family and friends, Deacon Hsu was inspired by the example of the Paulists he met at the University Catholic Center while earning a philosophy degree at the University of Texas at Austin. The big moment came on May 24, 2014 when Jimmy Hsu was ordained. “You will be consecrated to Christ in a very special way,” said Bishop Joe S. Vasquez of the Diocese of Austin, Texas – Deacon Hsu’s home diocese – who presided over the ordination. One of the things that has impressed us the most about the Paulists is the strong sense of community. (I suspect the same is true of most orders.) Evan has become part of a larger family and considers Jimmy a brother. We extend our congratulations to the newly ordained Reverend Jimmy Hsu and pray that God blesses his ministry. This entry was posted on June 1, 2014 by kevinleec in Seminary, Spirituality and tagged ordination, paulist, priest.